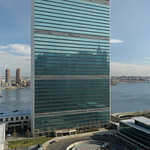 United Nations HQ (10%) and Secretary General's residence (100%) are wind powered. The 38-story Secretariat Building has east-west walls fully covered with thermopane glass, which is designed to absorb heat from sunlight. Renovation on the complex began in Fall 2007, the first since the building opened in 1950, and is expected to cost $1 billion. Projected to take 7 years, the building will be more energy efficient and achieve a LEED (The Leadership in Energy and Environmental Design) Silver rating—in other words, the complex is hoped to meet the standards for environmentally sustainable construction.